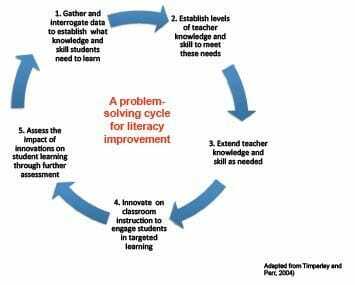 Inquiry approaches to literacy improvement have yielded promising results in the short term, and sustainable models of problem-solving for longer term improvements (Lai & McNaughton, 2008; Martsin, Singh & Glasswell, 2013; Timperley & Parr, 2010). The promise of inquiry models for systemic change lies in the contextualized nature of the change process. Inquiry frameworks exist to scaffold the change process by providing common protocols for school and teacher inquiry. In well-designed models, these protocols and processes promote a view of problem-solving as highly contextualized, flexible and unique to each school and community (Glasswell, Singh, McNaughton & Davis, 2009; Wilson, McNaughton & Lai, 2011). Inquiry approaches show great promise for all schools. School diversity means that a highly prescriptive, one size fits all model of literacy improvement is unlikely to be seen as valuable by all schools and communities, and is therefore unlikely to be effective. Initiatives and interventions need to be structured enough to ensure common goals are met, and yet they should be flexible enough to allow for responsive teaching and learning to occur in Australia's diverse schooling contexts. Inquiry approaches recognize and value diversity and responsiveness as key elements of a site-specific problem-solving process. The key point here is that effective systemic interventions are those that assist each school in its community context to become an improvement focused problem-solving entity. In general, effective school-based problem-solving approaches have three common factors and might be well described as “3D approaches”. The three Ds play out as follows. Teachers gather and use DIAGNOSTIC data on all students. They engage with leadership and colleagues in quality DIALOGUE and problem solving around those data to discuss possible interpretations and instructional interventions and solutions. Finally, the school’s professional learning community engages in multi-level DECISION-MAKING to solve problems. Decisions can be related to changing key classroom practices or resourcing, enhancing student or class management, or planning and implementing learning and pastoral care interventions. Decisions about proposed teacher learning are a central component in this cycle. Teachers may decide that they need additional professional development in order to help them be more effective in meeting students’ needs. The 3D process repeats three times each year to support the improvement agenda and to target evidence based interventions for teacher and student learning. This cycle is designed to develop an overall focus on successful schools, but also allows for nuanced site-specific adjustments to literacy improvement processes based on local evidence about students’ and teachers’ strengths and needs.